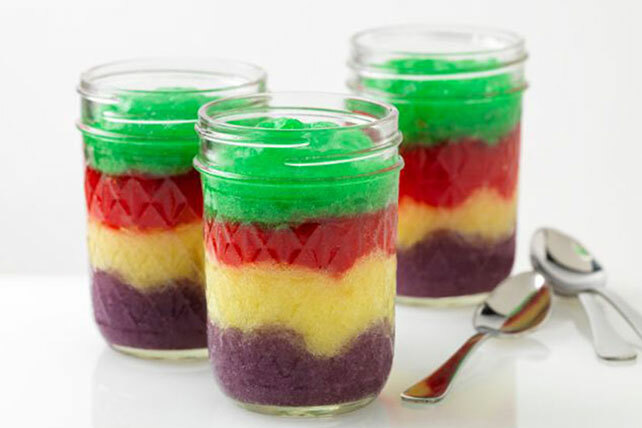 Whipped JELL-O in a rainbow of colors makes for a dessert that's as decorative as it is delicious. For maximum effect serve in clear glass jelly jars. Add 3/4 cup boiling water to 1 pkg. gelatin mix in medium bowl; stir 2 min. until completely dissolved. Add enough ice to 1/2 cup cold water to measure 1 cup. Add to dissolved gelatin; stir until slightly thickened. Remove any unmelted ice. Refrigerate 30 min. or until thickened but not set. Beat with mixer on high speed 2 min. or until about doubled in volume. Spoon into 12 (8-oz.) jelly jars. Prepare using JELL-O Sugar Free Gelatin.